If I could have a superpower, it would be to see into the kitchen drawers and cupboards of a holiday rental before I pay a deposit. I want to see the warped chopping boards, scuffed pans, handleless colanders and askew tongs. I would also rather know about the lone and ineffectual sponge and the incomplete food processor that promises pesto then demurs, lidless or bladeless, on the crux of the crush. I also want advance knowledge of the set-dressed kitchen, to see the tinny, unused saucepans bought all at once from the bachelor aisle of a big box store, along with an annoyingly narrow spatula, a knife that makes a ruler look perilously sharp and a pre-stocked spice rack full of musty dust. There are two ways to play. One, view it all as a challenge and find the fun in cutting onions as the chopping board seesaws across the bench. Two, bring some stuff. Here are my top tips on what kitchen equipment you might pack and some of the ingredients that make holiday eating easier and more delicious. I would rather forget my bathers than my large cast-iron pot with well-fitting lid. It heats evenly, can saute or slow-cook, and it happily moves from stovetop (induction too!) to oven. It's bulky and heavy but you can pack things inside it. I am also in love with my Australian-made Solidteknics frypan. It's naturally non-stick and is such a pleasure to use that I'll happily volunteer to make scrambled eggs for a dozen hungry holiday-makers. I travel with a 20-centimetre cook's knife with a large enough surface to smash a garlic clove. I don't have a proper knife sleeve, let alone a knife roll, but sensible cooks tend to have them. Actually, I just YouTubed "kitchen knife sheath" and I promise I will have cardboard safety sleeves by Christmas. I'll do one for my favourite cook's knife and, while I'm at it, I'll make one for my serrated bread knife because holiday house specimens are always horrible. So worth it. Avoid wobbles, slips and the previous tenant's gross ways with raw chicken by bringing your own handsome slab. It can also become a breadboard, dips tray and cheese platter. If you don't take one, do as chefs do and dampen a kitchen cloth or tea towel, lay it flat on the bench, and put the chopping board on top. It will minimise the troubling syndrome known as Beach Shack Board Creep. Sturdy, sealable containers are great for carrying food to your holiday, useful for impromptu picnics in bush or on beach, and invaluable when you're packing up for home. End-of-holiday waste is a big issue – no, the cleaners don't want it – but it's hard to commit to carrying things home when you envisage leftovers mashed into the floor of your car. Don't forget the ice packs either. Put salad dressing ingredients in a jar before you leave home and the bumps of your journey may even emulsify it on the way. Otherwise, shake up a simple vinaigrette when you arrive and keep building on it during your holiday. I have a preferred scrubbie and my pots and pans don't seem properly washed unless they're cleaned with it. If you have similar feelings (phobias?) then you might as well bring the only item standing between you and a permanent sense of grease and grime. We're assuming that you'll be shopping for fresh items, possibly at charming farmers' markets, fish co-ops and rustic food stores. But there are two good reasons to bring some basics from home. One, it's annoying to buy supplies you already have. Two, the body wants what it wants so if you have favourite pantry items, why not cart them with you? Holiday house salt is unlikely to be very appealing so save it for salting pasta water and bring your own premium flakes for finishing dishes. Once you're used to nice salt, it's very jarring to use pedestrian stuff. If you have good garlic at home, you might as well bring it along. Garlic supplies can be so dodgy and it's a shame to be stuck buying old, mushy, imported garlic when you know pert and fragrant cloves are languishing in your home pantry. Once you open olive oil, you should use it within a few weeks so there's no point leaving an open bottle at home, then buying one when you arrive at your holiday spot. Extra virgin olive oil can be used liberally: use it to cook with (yes, it's fine), in dressings and to finish dishes. Tea lovers are proudly pernickety. Of course it's fun to complain about the awful tea bags in your rental but wouldn't it be more enjoyable to moan over a nice cup of tea? Oh, and if you're serious enough to be a teapot user, you'll probably want to bring that, too. Even if you've heard there's a great cafe in the vicinity, at least bring enough coffee to get you through the first day. There is nothing worse than waking up, going to make coffee then realising you can't. It's bad for the caffeine addicts, it's worse for those around them. Head off disaster and bring the fixings. A few well-chosen and full-flavoured condiments, titbits and treats are all you need to turn whatever produce you stumble upon into memorable holiday-making dishes. A firm, cured chorizo sausage can be served on a cheese platter, swirled through pasta (including my lazy tomato spaghetti), chopped finely and fried to a flavoursome crisp to scatter over salads or roast vegetables, or added to roasts and braises for deep, salty tastiness. Smoked jalapeno chillies are muddled with spices and a little tomato then packed into tins to create the best cheat of all. Whizz it through cream cheese to create a spicy dip, chop it through tomatoes for a zingy salsa, add a little to chicken as it's cooking to add smoky backnotes. Firm, dry cheeses like parmesan, pecorino and salted ricotta (see bean recipe) can easily handle long car journeys without slumping into melty slop. Each of them is also great for adding oodles of flavour with a quick grate or crumble. Whether homemade or bought, lemons packed in salt and forgotten about for a few months can be finely chopped and added to pilafs, salads, vegetable dishes (see bean recipe), even sodas and cocktails. They don't mind a bit of fridge-free time either. Again, buy it or make it, so long as you take it. Tapenade can be smeared on toast, stirred through creme fraiche or cream cheese to make a dip, dolloped over steak or added to a pasta sauce. There's nothing like pulling out a little jar and saying, "Oh this? That's just my homemade vadouvan – it's a French-style curry powder, you know?" Add your fancy mix to soups, barbecued onions, burger patties and curries. You can also mix it through softened butter to create Cafe de Paris-style butter for melting over beach shack steaks. 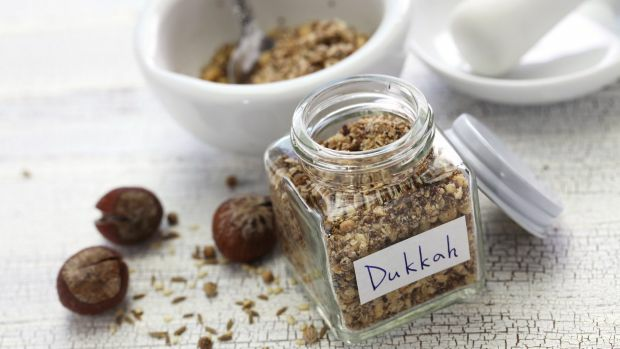 Bring dukkah for adding to marinades, dressings, pizzas or simply dipping your bread in. 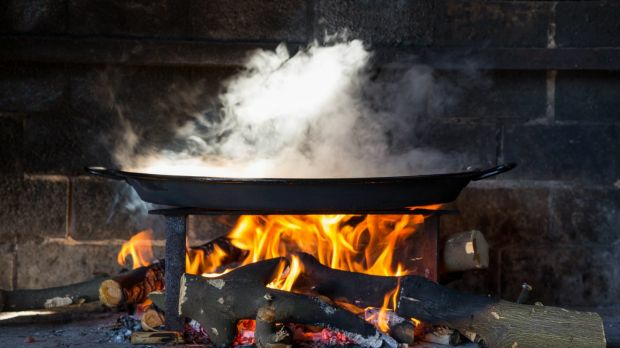 If you're a camper, it's even more important to be equipped, unless you're good at making saucepans from bark and stones. On the other hand, you don't want to take too much gear. 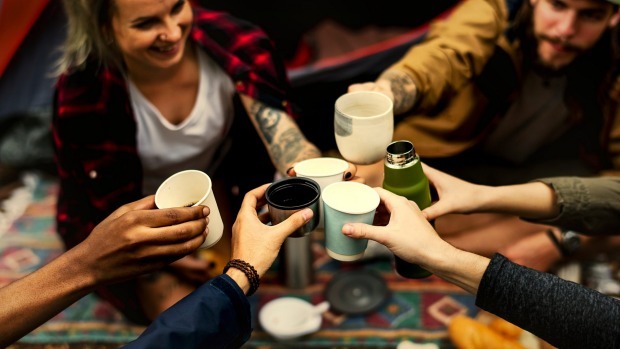 I go camping every summer with a trailer full of supplies and a bunch of foodie friends. Here is some wisdom gleaned from the back of beyond. Make your equipment work hard. If you have a camp oven, don't lug it along just for a hero roast chicken. Plan for a few meals in it, maybe a beef braise, damper, a curry, cinnamon buns. We have a paella pan and we use it for many more meals than its name suggests. It's great for breakfast fry-ups, pancakes, chicken cacciatore and even flatbread. Take produce that lasts. A box of tomatoes will become more and more delicious over a week. Start by slicing them for sandwiches and finish by smooshing them into my Lazy Tomato Spaghetti. Green beans are durable (see recipe), celery is a stayer and rosemary lasts forever. Coriander is a first-day herb and avocados are only for extreme optimists. Iceberg is ace but butter lettuce is slime on day three. Glamp here and there. We drank wine from plastic mugs for years then upgraded to Duralex tumblers, stored in a sturdy crate. We feel like kings and queens now. One of our party packs a tablecloth and brings it out on occasion. It's amazing how exciting it is to add a bit of fancy to our bush dining table. If you're starting out, mentally step through a meal or two and imagine what you'll need. It's a shame to be in the throes of dinner prep without a peeler, grater, can opener, cherry pitter or pepper grinder. Bring at least one easy meal: a big tub of frozen bolognese not only makes a handy ice block for a couple of days, but also allows you to stay longer on the beach knowing that tonight's dinner is as easy as making some spag to go with your bol. I love dishes that hero one vegetable and there's nothing better than shining a light on summer tomatoes. This spag is super basic and very delicious, relying on ripe, juicy tomatoes, warmed and seasoned. You can use any type of tomato but if you use cherry tomatoes, the whole dish can be cooked without picking up a knife. You can also serve your slumped tomatoes as is, maybe with garlic-rubbed bruschetta, or as a gleaming side dish to a barbecue. Coat a large, heavy-based frypan with a little olive oil and heat on medium. It's great if your pan can hold the tomatoes in one layer. Add the tomatoes and salt and cook gently, shaking the pan occasionally. You can get them going then hang out the beach towels or make a round of G&Ts, returning to jostle the tomatoes. When the tomatoes have started to collapse, add a little more olive oil, the sugar, vinegar and a few tablespoons of water. At this point, you could cover the pan – use a chopping board if there's no lid – and turn it down low to sweat a little more. 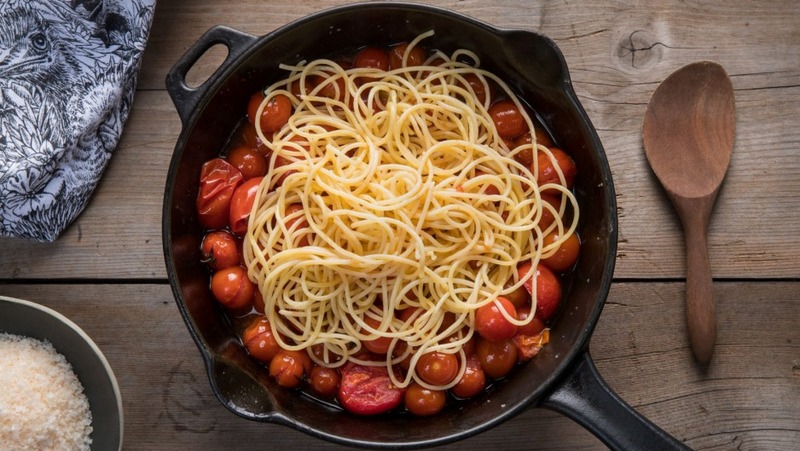 Serve tomatoes when you like the look of them, seasoned with salt and pepper to taste and swirled with spaghetti. 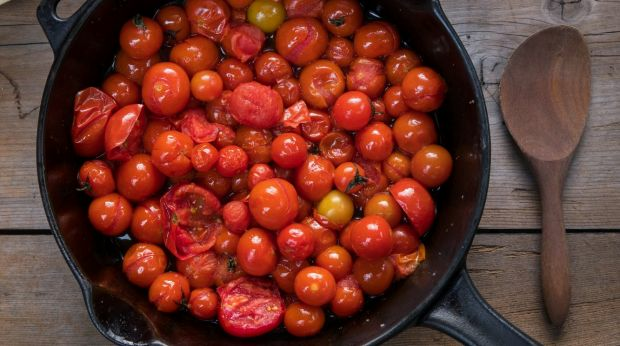 Your pan will have lots of sweet tomato juices: make sure everyone gets some of those. Great served warm or cold, this is a simple vegetable dish that can easily be made with broccoli, broccolini, peas or snow peas, either instead or in combination. When you're holidaying, it's nice to cook together, so if someone asks you what they can do to help, get them to trim the beans. Wash and trim the stalk end of the beans. Soak the currants in a little water to plump them up. Place about 3cm water in a saucepan with a lid. Add a large pinch of salt and the beans. The beans don't have to be submerged. Put the lid on, turn heat to high and cook for about six minutes, or until the lid is dancing and the beans are just cooked. Strain the beans. Refresh in iced water if serving cold, then strain. Toss beans with half the olive oil and place in a serving bowl. Strain the currants, crumble the ricotta and finely slice the preserved lemon. 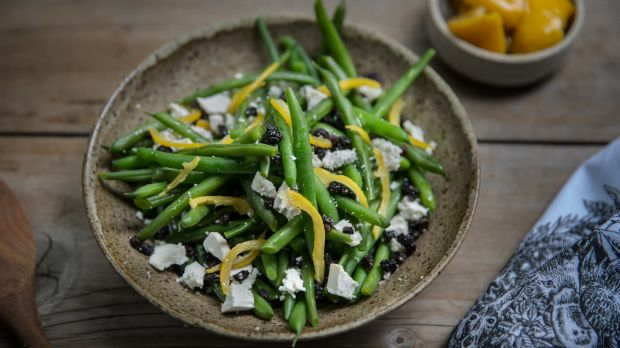 Scatter beans with currants, ricotta and lemon. Drizzle with a little more olive oil and scatter with remaining salt, to taste. *Ricotta salata is a firm, salty ricotta, sort of like a very dry feta.